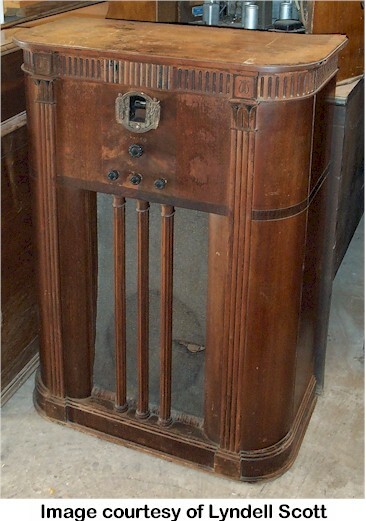 We had a heavy wooden floor model Philco AM radio that probably dated back to my parents’ wedding in 1934. It had separate on/off, tuning, volume and tone dials, a tuning eye, and the station frequencies were printed on a cylinder that displayed through a small square window. Tubes frequently burned out and had to be replaced. I remember wishing for the day I would be tall enough to look on top of its cabinet. For a few years it was the only radio in the house, to be supplemented by a white plaskon (I don’t think we called anything “plastic” at that time) Emerson table top for the kitchen. The Emerson sported a radial dial. And the commercials! Barney’s repeated this mantra: “…at 7th Avenue and 17th Street, the only store of its kind in New York!” On almost every clear weekend morning, I.J.Fox the furrier supplemented its commercials with sky writing, first using a single airplane (the “I” would sometimes dissipate before the “X” was finished), then two, and even later a squadron of six or seven “sky-typers” who flew wing-to-wing and quickly set out a digital smoke banner. January 16th, 2007 at 12:09 am IJ Fox in the sky. It is a beautiful thing, or so i’ve heard. I am a decendent of IJ Fox, and I am just beggining to trace my routes. There is so much history out there about him. He was my great uncle. I come from a long line of furriers, starting with Fox. My grandmother used to tell me stories about visiting his mansion. He owned a lake and a mountain. I am tryign to find out more. Do you remember anything else about the company? March 11th, 2008 at 10:53 am My mother’s maiden name was DAVIS. This name had been changed from DAVIDOWICZ. I remember my mother telling me that one of her cousins was married to I. J. Fox. She also said that I. J. Fox came to the United States from England. My morhter also said that they had an estate in Peekskill, Westchester County. March 25th, 2009 at 11:20 am I am the grandson of I.J. Fox. Let me know fi there is any information I can offer.